Just regular folks. : We are infested. oh man, I can relate. 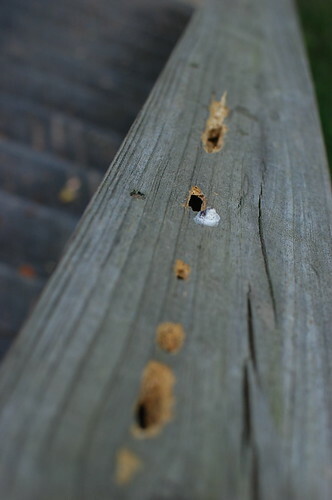 We have carpenter ants and wasps. 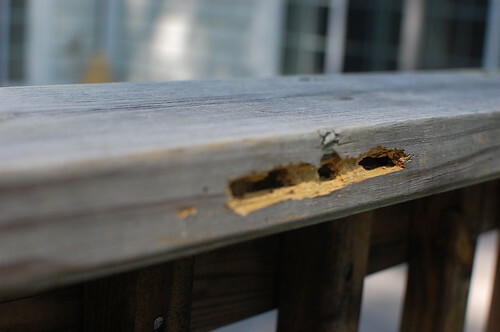 The deck is crumbling before our eyes (you can actually fall through in some spots). We are praying that in the next month we can pull it out and put in a cement patio - there aren't any pests that eat cement are there?? We actually have wasps coming into the house now too, we're looking for the nest and I'm pretty sure I'm going to pass out when we find it, it's gotta be huge! The woodpecker thing we don't have though, that thing looks destructive. I cringe at the sight of pesticides but I totally understand it now.... Unfortunatly. Good luck! 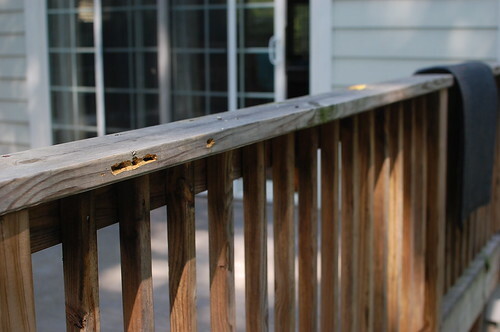 Use some wood filler to fill those holes. They did not use treated wood. If getting worse, replace those with treated wood. No big deal. Take it easy. Go to Lowis and buy something for ants. It works. We had lots of ants at home. I used many non-chemical stuffs such as garlic to keep them away. But it did not work. Finally I went Lowis spent $5.00 and it worked very well. Well, I guess the wood was not treated. Replace it with treated wood. I will throw away those decomposed pile stuff. It attracts a lot of ??? When applying chemical, make sure fence out using yellow ribbons (Lowes) several days so kids will not play close to it. Need to have termite inspection regularly. Whoa! Those are some big holes. Here in Tejas they say "either you have termites, hd termites or are gonna have termites" We were swarmed several springs in a row. So, we had to finally break down and spend some $$$$ that came with a guarantee.